We have a family breakfast favorite that is exclusively eaten during the Winter months. One that was also a family favorite in my house growing up in the Philippines. Champorado! Dubbed as the breakfast of champions then and might as well be! Now, our version of the traditional Filipino Champorado is quite different though. It is made up of heartier ingredients and we certainly love it hot! Best breakfast food when it's chilly outside. a little backgrounder on the Traditional Champorado. Original recipe is made of glutinous rice (malagkit), flavored with Milo, our popular chocolate malt beverage mix and sweetened with condensed milk or sugar. But due to the stickiness of the glutinous rice, most household prefer the regular white rice which takes shorter to cook. The only downside of the white rice is that it gets utterly mushy and tastes bland. This is where Steel Cut Oats became the starring role in our Champorado. It is nuttier and chewier. It takes a lot longer to cook it but it's so worth the wait. Best of all, it is healthier. Now if time is an issue, you can replace Steel Cut Oats with regular quick-cook oats - which we do sometimes. We also tweaked the way we make our Champorado to give us more control to "personalize" it according to our taste. Serve the oatmeal piping hot in a bowl. It should be hot enough so you can melt your chocolate chips. The amount of chocolate chips you mix in depends on how chocolate-y you want your Champorado to be. I usually put in about 15 pieces. Less if they're of regular size. 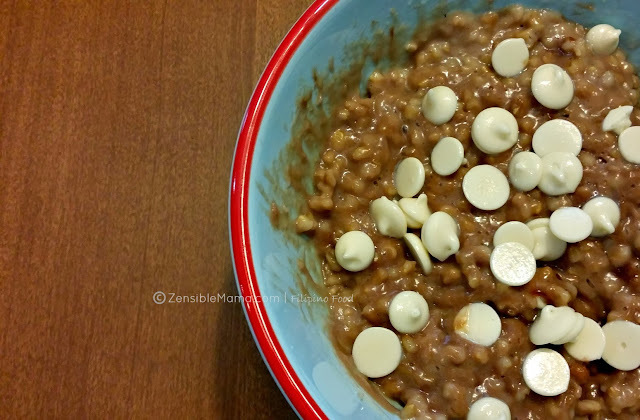 Mix well until chocolate covers all your oatmeal. Drizzle it with condensed milk or maple to sweeten it. Adjust according to taste. Top it off with a sprinkle of white chocolate chips (optional) and voila! Enjoy your very own Champorado. Bonus tip: Double the recipe for an extra batch. Refrigerate the excess and enjoy a daily dose of Champorado while they last. All you need to do is reheat the amount you need. Add water when necessary. I'm so pinning this. 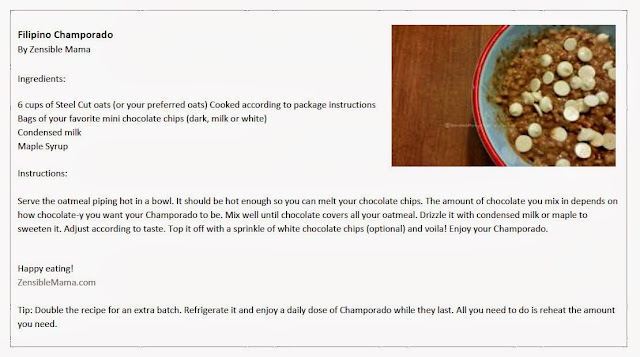 First homemade champorado recipe I've seen. Using oats is brilliant!